Leave some things behind in 2011! Leave some things behind in 2011 - like your love-handles! CoolSculpting™ by ZELTIQ™ is a breakthrough, non-invasive technology that freezes away stubborn fat. CoolSculpting gently targets and cools unwanted fat cells in the selected area to induce a noticeable, natural-looking reduction in fat bulges. Each CoolSculpting procedure results in an average 20% (or more!) reduction of fat in the treated area. Unlike most other methods of fat reduction, CoolSculpting involves no needles, surgery, or downtime. Patients often spend the one to two hours of procedure time reading, watching a movie on our iPad, working on their laptops, or simply relaxing. 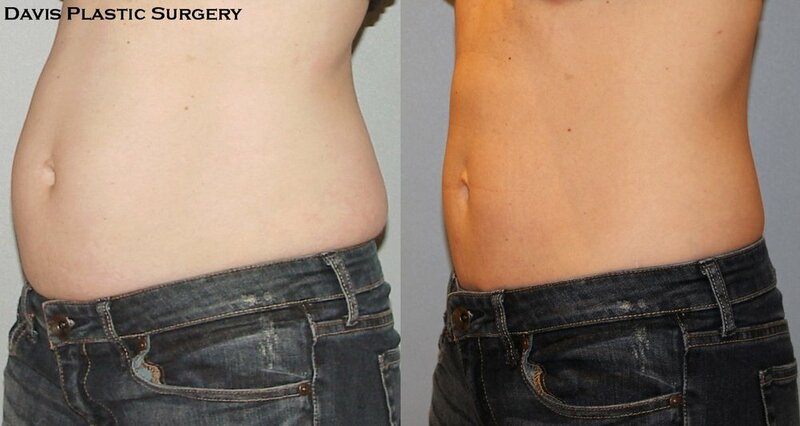 This Davis Plastic Surgery patient is 8 weeks out from CoolSculpting to her central abdomen and love-handles. What happens during the procedure? First we will work with you to determine the best areas to treat. For instance, if your goal is to reduce your love handles, our staff will position the system on your side. The device then draws the bulge up between two cooling panels. The sensation is a firm tug and pull - enough of a pull to ensure the selected tissue will be cooled most efficiently. What does it feel like? As the panels go to work in the first few minutes, you will feel a sensation of intense cold. This soon dissipates. You will be seated comfortably or lying down during the procedure in a comfortable and private room. Can I return to normal activities after the procedure? Yes. The CoolSculpting procedure is completely non-invasive, so you can return to normal activities immediately. You may experience redness, minor bruising, tingling, or numbness in the treated area, but this is temporary. When will I see results? You may start to see changes as quickly as three weeks after your treatment, and will experience the most dramatic results after two months. But your body will still be flushing fat cells at that time, and will continue doing so for up to four months. Are the results permanent? During the CoolSculpting procedure, the treated fat cells are eliminated. As long as you maintain your weight with normal diet and exercise, long-term results should remain stable. Older PostWhat are my options for a flatter stomach?